Are you flying through Heathrow airport on Saturday? Because you might be in for a royal treat. Even if you haven’t been invited to the royal wedding (we didn’t get an invite either), Heathrow Airport is celebrating the occasion by serving 1,000 handmade lemon and elderflower cupcakes (the same flavor of the royal wedding cake) to inbound passengers who arrive at the airport between 10 a.m. and 4 p.m. local time. More: Who’s Actually Paying the Bill(s) for the Royal Wedding? 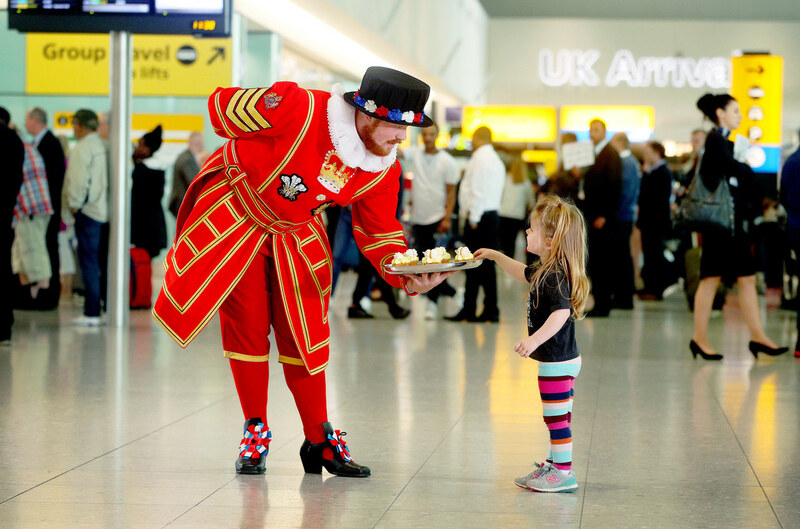 “At Heathrow, we’re passionate about creating memorable experiences for all our passengers and certainly want our travelers to enjoy the royal wedding celebration in style,” Chris Garton, chief operating officer at Heathrow, said in a press release. Be sure to pack a fancy hat, because passengers can also expect to see Queen’s Guard, Beefeaters (the nickname for the guards at the Tower of London) and patriotic flags and banners as well as the sounds of a royal trumpeter. The airport will also be broadcasting the ceremony in all of their terminals, so you don’t have to wrangle a Wi-Fi connection on your phone to watch the special event. Basically, the airport is forming their own personal wedding party, even if the bride and groom will be miles away. Celebrating the royal wedding isn’t just an act of national pride, it’s also a celebration of tourism. Heathrow reports that in the week leading up to the wedding, they’re expecting 9 percent more arrivals from North America and more than 3 percent total growth over last year. “The royal wedding has driven an increase in international visitors who wish to experience a uniquely joyful British event,” Garton said. Joyful indeed. Here’s to the happy couple!